Critique is a special type of learning experience that happens during a design studio. It emphasizes the negative in order to help students improve their work. During critique, students present their work to a group. The group identifies places where the work can improve. They discuss alternative solutions, sketch those solutions, and work collaboratively to explore which changes will benefit the work the most. A critique begins as a student displays and presents their work. I emphasize the physicality of design deliverables—I ask students to print out their work and pin it up on the wall. This is true even for digital items, like screens, presentations, or animations (for presentations, I have the students print their slides. For animations, I have the students print keyframes of their videos). When the work is displayed on the wall, several things happen. First, the entire group can all observe the work at once. This means that they are all baselined on what the student has done, all responding to the same work, and all sharing an understanding of the scope and breadth of creative material. Next, the group can see the work in an end-to-end story. Design always exists in a narrative context, and seeing the work on the wall gives physical expanse so that each student can read the story. This is often a series of frames; for example, if the student is presenting the redesign of a mobile application, they can show each frame in sequence. This means that the group can respond not only to the interface on any given screen, but also to the flow a user will experience through the product—it helps ground the critique in both detail but also in behavior. Additionally, pinning up the work physically instead of displaying it on a screen helps the student learn the best ways to communicate complex ideas to an audience (a skill they will need constantly when they are working professionally). The first time a student pins up, they inevitably realize that the work is too small, too light, lacking annotation, and often nearly incomprehensible to the other students. This gives us an opportunity to discuss presentation and persuasion, and how every form of presentation (including critique) is an opportunity to shape opinion and comprehension. I wrote a book with more detail about the value of a critique and how to succesfully run one. 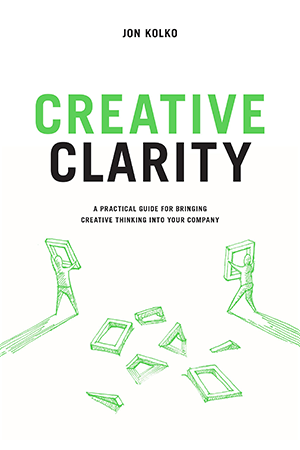 Explore Creative Clarity at Amazon. Once the work is pinned up, the critique begins. While it’s tempting for the student to explain the work, I encourage them to only describe the “rules of engagement”, and then simply step back and let the group begin. The work should be self-explanatory. An explanation seems harmless, but it actually presents a defensive position, as if the student needs to rationalize their design decisions. That creates a dynamic of “me vs. them”, and that’s not healthy in a critique. Download an overview presentation on how to run a critique, as a Powerpoint document. After they establish the rules of critique, I ask the student to be quiet. Depending on how advanced the class is, I either take a backseat myself, or I start the critique. Early in a student’s educational journey, they are afraid to speak their mind. In these cases, I’ll start the critique by pointing out an element that isn’t working, and I’ll offer suggestions on how to improve it. The benefit of starting the critique is that students see and can emulate the way I phrase my comments. There’s a challenge, though; younger or less experienced students will often follow my lead—they will agree with what I say and be afraid to voice a dissenting opinion. No matter if I start the critique or someone else begins, I exemplify the behavior I want students to have—I sketch directly on top of the student’s work with design changes and suggestions. When a student offers criticism, I’ll prompt them to “show us” instead of telling us. Drawing a solution has several benefits. It captures the idea so that the designer has a record of it later. And, it forces a level of specificity from the critiquer; they can’t simply say things like “that isn’t working” because they have to propose a way to make it work. During the critique, I pay attention to, and correct, language from the students. When they say things like “I don’t like that” or “That’s weird”, I prompt them—“what do you mean?” I ask them to focus on problems, not positive elements or things that are working. I ask them to explain why they react in a certain way. What about the design is bad? What prompted the comment that something is “weird”? Sometimes, a critique feels like it’s turning personal. I’ll see the person who has the work on the wall becoming defensive and starting to entrench—defending their work, and ignoring the benefits of the critique. When this happens, I’ll stop the critique and hold a meta conversation. Instead of critiquing the work, we’ll critique the critique itself. I’ll point out how the person became defensive, and we’ll brainstorm ways to avoid this type of reaction in the future. As the critique continues, I’ll constantly remind students of the rules of engagement and best practices. These typically include prompts to offer suggestions for improvement, to sketch solutions, and to identify problems and not just good qualities. When a critique is over, I’ll often ask the student if they are aware of what they will change in future iterations. This causes a level of summative reflection—it encourages them to replay the critique, quickly, and make sure they synthesized the content with enough detail that they can move forward. To get around this, I hold critique as frequently as possible. I don’t wait for a student to be “done” with a project before encouraging criticism of it. In this way, the goal of an in-class critique isn’t just to improve the work. It’s also to instill a culture of criticism for the student so they stop seeing their work as precious. Design is iterative and is never done, and if a student starts to treat their work as “finished”, they will be reluctant to change it even when confronted with a better solution. A culture of criticism means that critique becomes just another part of the design process, just like research, sketching, or user testing.